The Maryland State Police are investigating whether a crash in Brandywine that sent 11 people to the hospital on Sunday afternoon was caused by street racing. These things never end well, do they? TV station WUSA9 reports that the crash happened yesterday afternoon in the 15000 block of Crain Highway in Brandywine, southeast of Washington D.C. 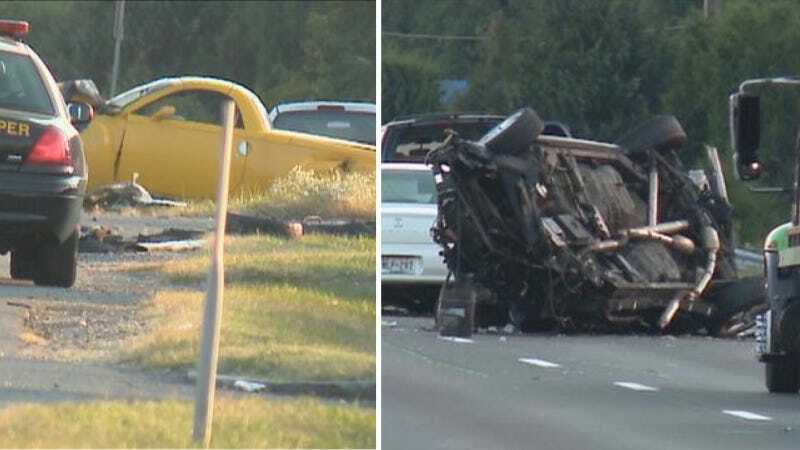 Witnesses told police they saw a black Mercury Marauder — the car pictured wrong side up — traveling at a high speed down the northbound lanes of the freeway when it crossed the median and slammed into oncoming traffic, causing a "chain reaction wreck" that involved five other cars. The witnesses told police the crash may have been caused by the Marauder attempting to race another car. Police officials told the TV station that charges are pending. NBC Washington says four children were among the people hurt in the wreck.